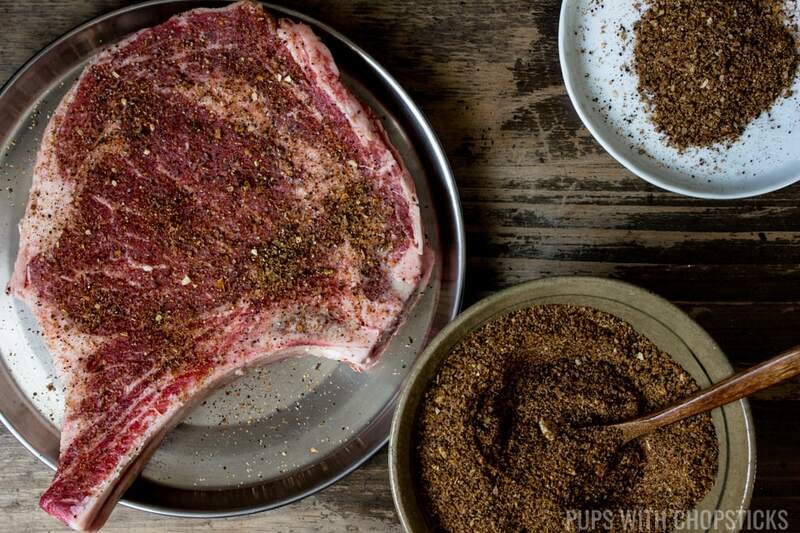 This all purpose coffee rub is our all-time favorite dry rub that we use on everything. It’s earthy, flavorful and great to use on anything you want to quickly cook up on the grill. Quick to make – you can double, triple or quadruple the recipe so that you only need to make it once and have plenty leftover. Every Spring, I clean off my BBQ and am super stoked for the warmer weather and grilling season. Whenever I do grill something, I normally just throw together a spice rub on the fly but this time I thought I would actually document it so I could share it to anyone in search for all purpose coffee rub. My coffee rub doesn’t contain a lot of salt or sugar in it. My main reason for doing this is so that the rub gives the meats a good foundation of flavor but will not conflict with any sauces (if you choose to brush on any at the end of cooking). I don’t want the end products to be too salty or too sweet. The rub should be enhancing the food not overpowering it. 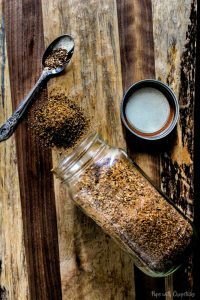 This all purpose coffee rub that you can use on any type of meats (chicken, beef or pork) and it is not limited to just for grilling. I have used this rub on chicken and pork that I have roasted in the oven and it turned out just as fantastic. What Does ‘Coffee Rub’ Taste Like? Not like coffee, oddly. It has a dark earthy flavour combined with a nice balance of garlic and onion notes with a background flavour of cumin. The rub is low in sugar and salt so that you don’t get an overly salty or overly sweet result, which won’t overpower your BBQ sauces. We added a bit of cayenne for a spicy kick but that is completely optional and can be omitted. 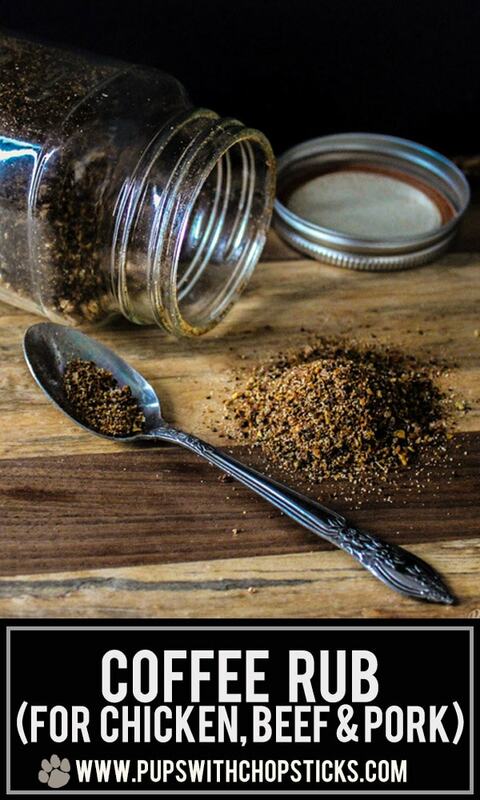 For this coffee rub recipe, all ingredients can be found at your local grocery store. I can assure you it’s not! 🙂 That was also my first reaction as well as I was doing some testing as black coffee is usually very strong and very bitter but the spices meld very well with the coffee and instead it provides a subtle dark earthy flavour to the rub. Tip #1 : Please do not use ‘used’ coffee grounds. There’s no flavour in it. Optional : Cayenne for a bit of a spicy kick is also quite nice. HOW FINE DO YOU GROUND UP THE COFFEE? This one is a personal preference but I’ll list off some of our findings. FINE GROUND – We found that grinding it up too finely, made it stick to the meat *too* much and it doesn’t give the other spices a chance to latch on to the meat since it falls right off because the fine coffee kind of just takes over. 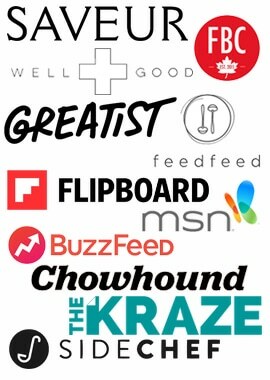 MEDIUM GROUND – Just right. Has enough surface area to have a subtle coffee, earthy flavour. It also matches the consistency of the other spices. This is our preference. COARSE GROUND – Not enough surface area for flavour and doesn’t stick to the meat as well since it sticks on last because of the size. Depending on how coarse you grind it up you may even start noticing that you are actually chewing on the grounds and having them stuck to your teeth. 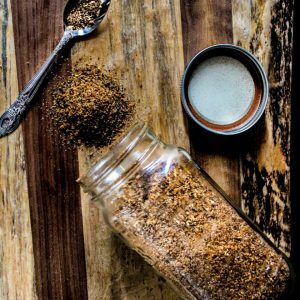 You can use any type of coffee for this rub (light, medium or dark roast). The darker the roast the stronger the flavour. …but maybe refrain from using flavoured coffee 😛 unless “Creme Brulee Toffee” chicken is totally your thing. Tip #2 : To make this an even simpler and quicker rub, we sometimes just buy pre-ground coffee for this. Grind up the coffee (or use pre-ground coffee) and mix the ingredients together! This is a very versatile rub. You can use this on ribs, chicken, beef, pork, lamb – pretty much anything! If you make a large batch, keep it in a well sealed container and store in a cool dry spot away from the sun. Sunlight damages spices and takes away the flavour with time. Happy Spring! Time to hit the grills! 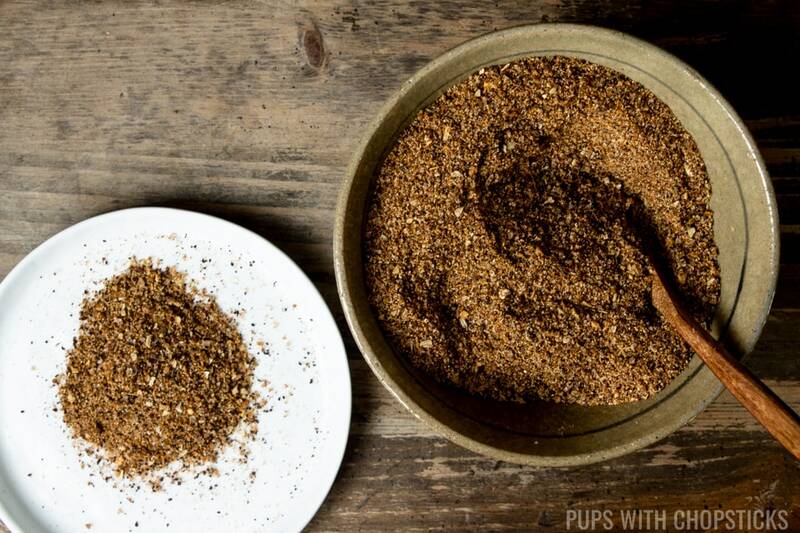 This all purpose coffee rub is our all-time favourite dry rub that we use on everything. It’s earthy, flavourful and great to use on anything you want to quickly cook up on the grill. Quick to make – you can double, triple or quadruple the recipe so that you only need to make it once and have plenty leftover. Combine together in a large bowl and mix. Store in a well sealed container away from direct sunlight. 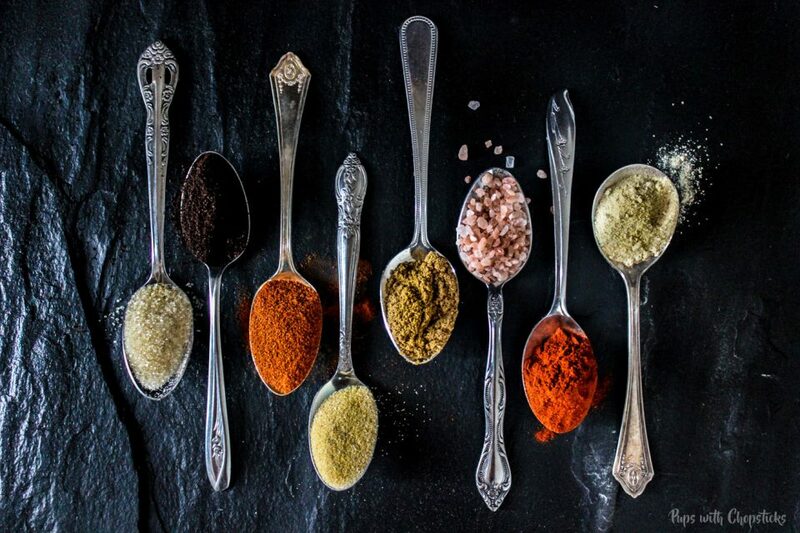 Sunlight damages spices and takes away the flavour with time. Can you use it, as a dry cure for making bacon? Dry curing meat requires a lot of salt to draw out the moisture and keep bacteria levels low and unfortunately this recipe does not have enough salt for that purpose. However, I don’t see why you cannot use this recipe for dry curing if you increase the salt. Just make sure you increase the salt amount by a lot (ie. instead of 1 tablespoon of salt like in the recipe, I would increase the salt to 1/2 – 3/4 cup or a bit more) You can even increase the sugar a bit more too. I’m so excited that it is finally warm enough to start grilling again! Great tips on coffee grind texture too! This coffee dry rub is going to be an excellent addition to our seasoning mixes and rubs. Can’t wait to make it and try it out! We made your coffee rub a few days ago! It tasted amazing on our grilled ribs! So easy and really flavourful; love the earthy flavour and spicy heat! This coffee dry rub is just in time! I’ve been using this recipe that always tastes like straight salt for my dry rub, crazy. I’ve never heard of a coffee dry rub but I can’t wait to try it now, thanks for a wonderful recipe! 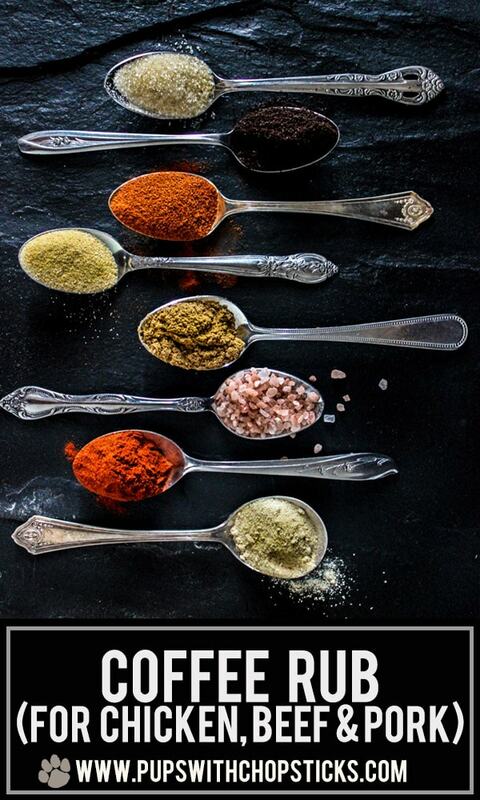 Great advice on the spices. Don’t leave them out where the sun can get them. I’ve used coffee in chili but I’ve never tried it in a rub. Funny, I’ve seen recipes for ancho coffee rubbed steak but never managed to make the connection in my head. Thanks for closing that loop! This rub looks spot on. Not too sweet, not too fussy, just my kind of rub. I’m thinking I can get to my grill today as well (I hope). How much cayenne should I go for? I like a bit of kick. Yes! 😀 I couldn’t wait and used it on an oven roasted chicken 😀 haha Yay for warmer weather!